Crows is quite obscure; the game received only a small run in Japan. Note 1: Like Beat ‘Em Ups? 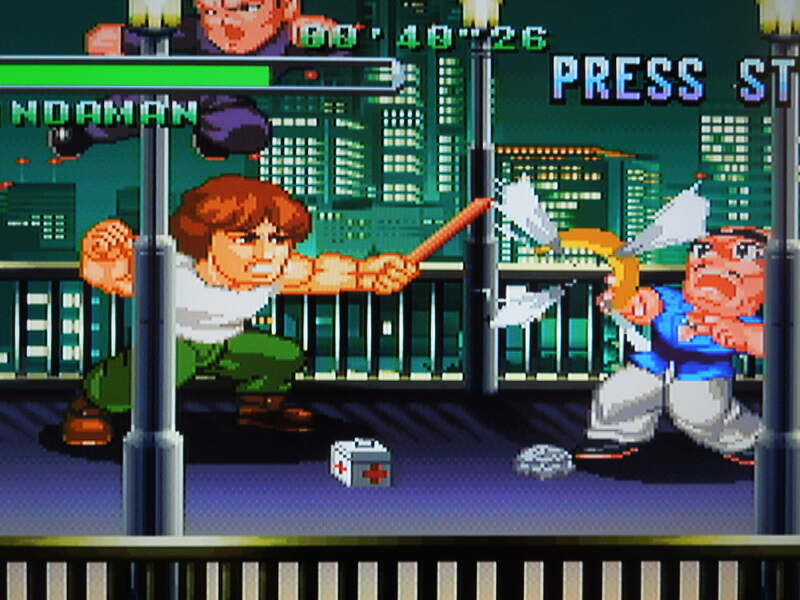 Check out my reviews of D & D, Double Dragon II, Bare Knuckle III, Final Fight Guy, Final Fight 2, MIghty Final Fight, Sengoku 3, Nekketsu Oyako, and Warriors of Fate! Note 2: This game was played on a U.S. Sega Saturn with a 4M Action Replay cartridge plugged into the cartridge slot. This allows Japanese games to play on the console. The console was connected to a 32-inch HD tv using S-video cables. Quick History: Now, this is an obscure game. Crows,:The Battle Action for Sega Saturn was released in 1997 only for the Japanese Sega Saturn. Crows is based on the Japanese comic manga series of the same name. 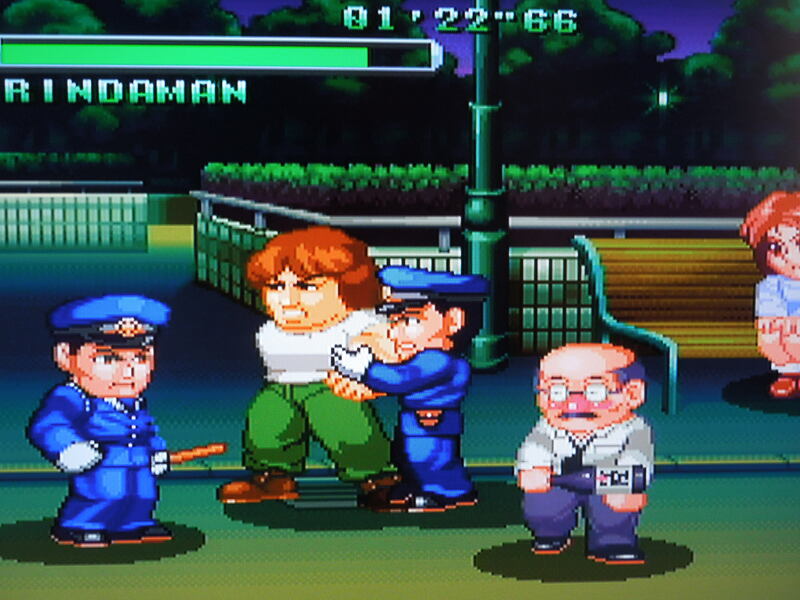 The game is a Beat ‘Em Up, and is drawn in a super-deformed style. There is not much information on the Internet about this game, but what I could find suggests that this game saw a very limited release in Japan (around 5,000 copies, possibly). The game has not been ported to any other consoles, nor made available for download on any modern gaming consoles. 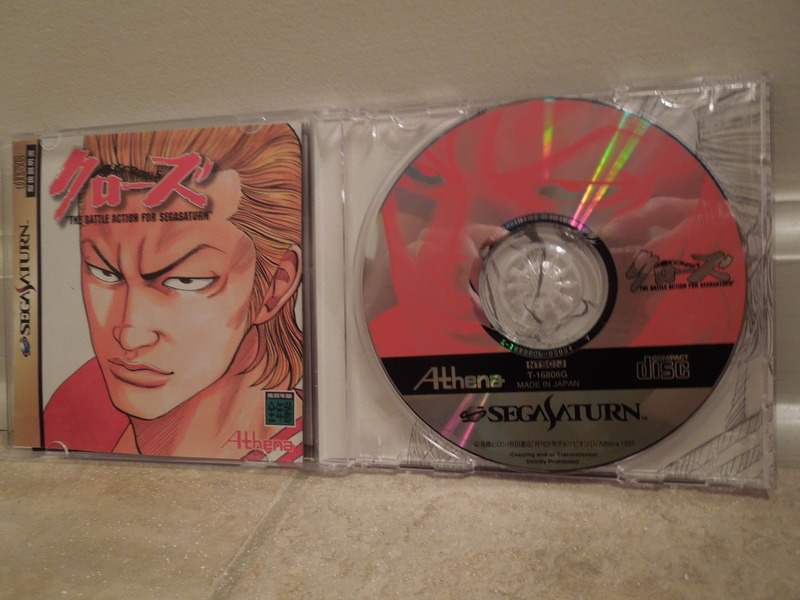 Story: This game’s story is in Japanese, and I cannot find a thing about it anywhere on the Internet. 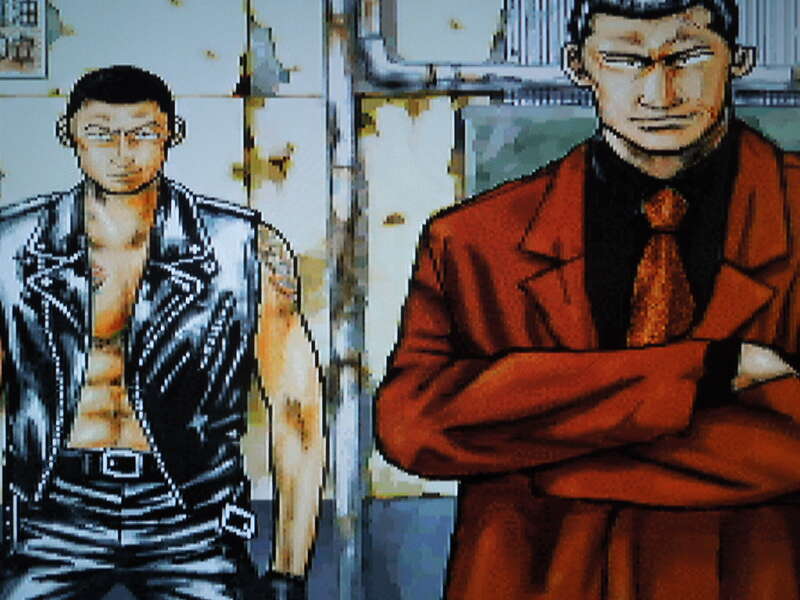 Based on the cut scenes, here’s what I can surmise: Japanese punks fight it out with other punks, cops, and rival gang members for supremacy of the streets. 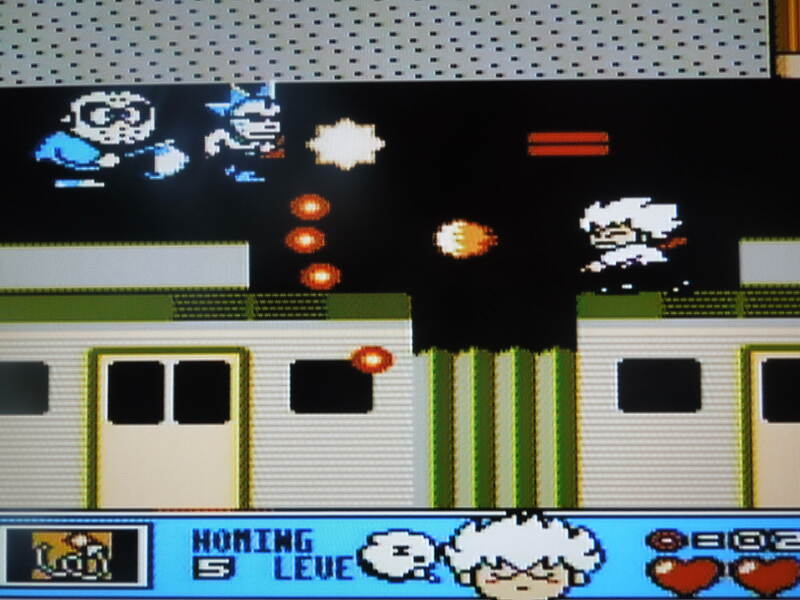 The fight with the final boss takes place on the roof of a high school, so apparently the punks want not only control of the streets, but control of the educational facilities as well! Gameplay: You pick from among 4 different punks, although only 2 are available to start the game, and the other 2 join later (after you defeat them in battle). Their names are Harumichi, Rindaman, Ryushin, and Bitoh. Each one has a different martial arts fighting style. Between the 2 originally-selectable characters, Harumichi is quick but weak and Rindaman is slow but strong. Once you have selected your character, you’ll fight through 5 Stages – each made up of a few short Rounds. These range from the streets, to a construction site, to the halls and roof of a high school. You’ll fight waves of thugs, most which take a couple of knockdowns to beat. At the end of each level, you’ll fight a boss. The bosses can be tough until you figure out their patterns. After every stage, you have the option to change characters. Sticks and pipes are fair game in Crows. Your special attack is a customizable combo chain. Control: This game makes use of all of the Saturn’s buttons, although you can change the layout in the Options menu. A punches. B kicks. C jumps. X Escapes (slides or dashes quickly in one direction). Y taunts your enemies. Z blocks (you’ll guard for approximately 2 seconds). L uses ‘Combo 1,’ your energy-draining special attack. R uses ‘Combo 2,’ your other energy-draining special attack. You can also execute the combos by pressing either A+B or B+C. You run by double-tapping and holding the direction you’re facing on the control pad. While running, pressing A or B unleashes a flying tackle (Harumichi) or big boot (Rindaman). Jumping, then pressing A or B executes a flying kick (Harumichi) or body press (Rindaman). Additionally, Harumichi can kick opponents while they’re down by tapping A or B while they’re lying prone. If you get in close to an enemy, you’ll automatically grab them. Pressing A after grabbing an opponent will execute a headbutt (Harumichi) or knee smash (Rindaman). Pressing B after grabbing an opponent will throw them – you can knock down approaching enemies by throwing a thug into them. You can also pick up sticks or pipes – A swings them at enemies, and B throws them at enemies. Sometimes, if you get knocked down, you’ll have to tap A to make your character get up – if you don’t tap fast enough, you’ll lose a life. Sound and Music: The sound is slightly above average. 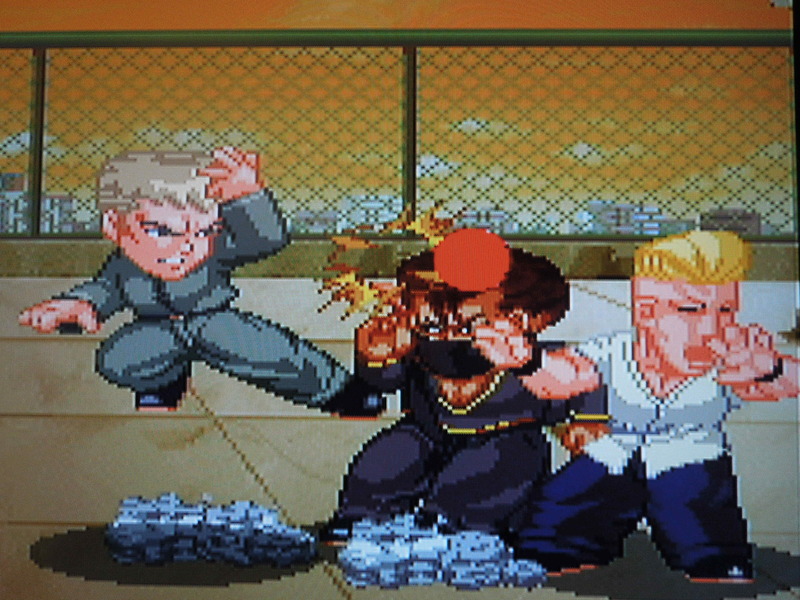 The whacks and cracks that you’d want in a Beat ‘Em Up are here. When you press the Taunt button, you’re character says something menacing in Japanese. The music is decent enough. Comic-style cutscenes play in between stages. Language Barrier: No and Yes. No, if you just want to play a Beat ‘Em Up through 5 stages of action. 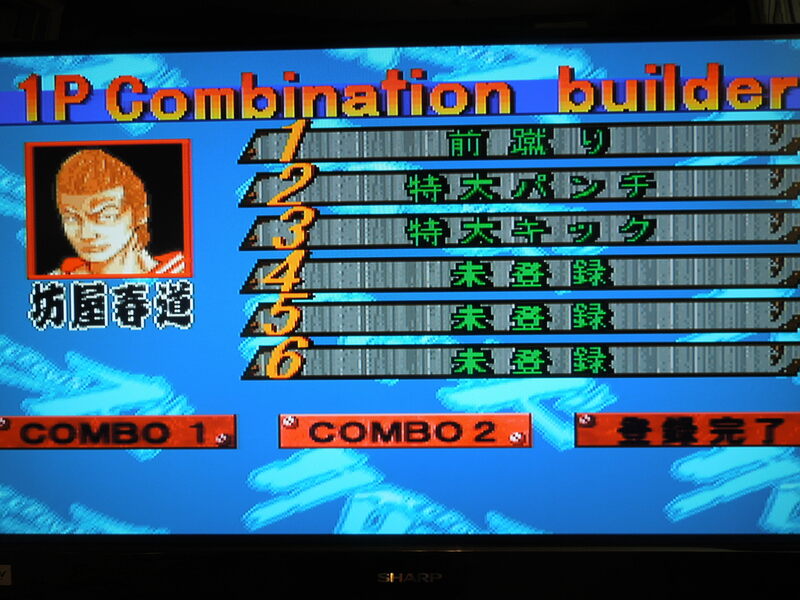 Yes, if you want to understand the story, or set up your ‘combo builder.’ After you select your character, you can ‘build’ your combo attack specials, but since they’re all in Japanese, you won’t know what you’re picking – it’s best just to skip this and go with what the game’s default combo specials are. Your combo chain does get longer as you advance further into the stages of the game, by the way. The Options are in English, fortunately. Oddly, some of the 5 Stages have names that are in English, like Stage 1: Tattoo, while others use Japanese words. Options: You can change the button layout here, and you can change the difficulty among Easy, Normal, and Hard. The game is automatically set to give you 5 credits (3 lives per credit), but on the title screen, if you press L and R alternately, you can rack the credits up to 9. On Hard, this is recommended. Enemies: The enemies in this game are often humorous. Punch a street sweeper who is minding his own business, trying to do his job, and he’ll go on the offensive. Drunken Japanese businessmen stagger down the street and try to attack you with bottles of booze. Harass a couple in the park and they’ll run away and come back with the cops. One boss repeatedly flips you off after knocking you down, adding insult to injury. Items: Throughout the game, you’ll break open crates and barrels that contain soda cans that increase speed or first aid kits that increase your energy. There are also other items you can pick up in the game, like beer crates, flower pots, or mailboxes – these you can throw at enemies, although you cannot move once you pick them up, unlike with sticks and pipes. Even the cops have it in for you. So, where can I find this game? You can order it on ebay from Japan, or play it on a computer emulator. Bosses can be tough until you figure out their patterns. Conclusion: Crows: the Battle Action is a decent Beat ‘Em Up. 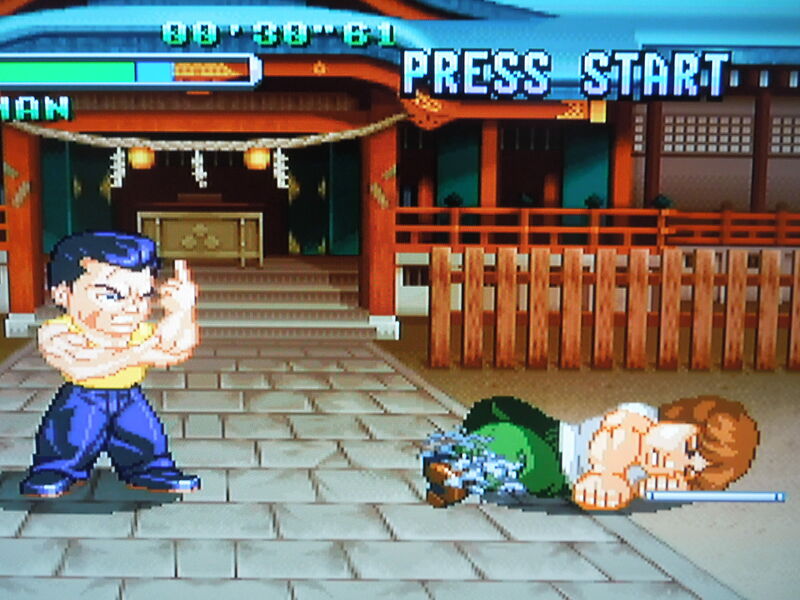 The art style is great, making this one of the better-looking Beat ‘Em Ups I’ve seen for any system. As many as 5 or 6 enemies can appear on-screen at once, and this game got it right where it matters – 2 player co-op. You share the credits in 2 player mode, but the game becomes much easier. Fortunately, you can’t strike your partner, but you can accidentally hit him with a thrown enemy or thrown stick or pipe. Your special move, the combo, involves you repeatedly striking an enemy, and sometimes ending with a throw, like a German suplex. While the special moves look cool, for every strike you connect with in the sequence, you’ll lose a portion of life, and sometimes it’s hard to connect at all. This game would have been better off with the old classic ‘whirling roundhouse’ or something similar as a special move. The action in Crows is a bit slow-paced compared to some other Beat ‘Em Ups, but because of the short rounds that make up each of the 5 stages, things move along quick enough. From beginning to end, the game will take around an hour and 15 minutes to beat. 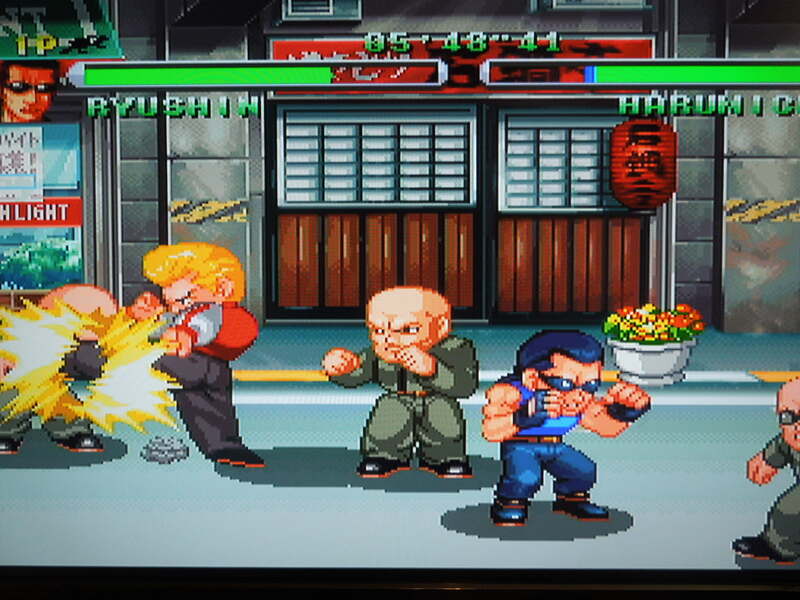 This Beat ‘Em Up is somewhere in the middle of the genre. It’s not the best, but it controls well and looks top notch. 2 player co-op makes the game much easier.